The Don River watershed stretches about 32 kilometres from the Oak Ridges Moraine down to Lake Ontario. Although there is no end-to-end valley trail, the Don offers many opportunities for long and short walks away from the city traffic. 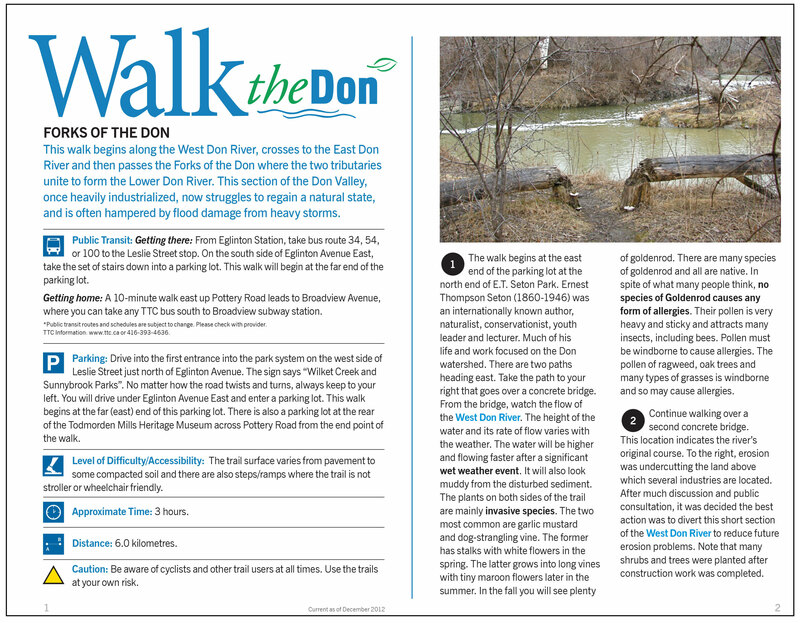 Walk the Don is a series of self-guided interpretive walks located throughout the watershed in Toronto and York Region. All walks use prepared trails and are suitable for family use. Download one of the trail guides (pdf) shown below and spend an afternoon enjoying the river valley! Note: These are all third party walks not prepared by torontohiking.com but are listed here for your convenience. This walk follows a section of Burke Brook, a tributary of the West Don River, as it winds its way through a varied urban area. The walk begins where the stream is buried beneath a formal garden and ends as it flows naturally through a forested ravine. Along the way, specific plants will be described and identified. Discover the natural heritage of this popular trail through the East Don Parkland. Follow German Mills Creek and the East Don River as they meander through lush forested ravine, wildflower meadows and wetlands teeming with life. The natural channel, series of wetlands and abundance of native species make this section of the East Don River well worth the exploration. This walk begins along the West Don River, crosses to the East Don River and then passes the Forks of the Don where the two tributaries unite to form the Lower Don River. This section of the Don Valley, once heavily industrialized, now struggles to regain a natural state, and is often hampered by flood damage from heavy storms. This walk follows the Upper West Don River in the City of Vaughan southwards from Langstaff Park on Langstaff Road (east of Keele Street) to Steeles Avenue West (west of Dufferin Street). The route follows the southern portion of the Bartley Smith Greenway (BSG), an as-yet incomplete trail system through the centre of Vaughan from Teston Road down to Steeles Avenue West. Note that the start of this walk is at a fenced seasonal sports field (Langstaff Park) that may be formally closed during the winter months. Imagine a Lower Don River, in the late 1800s, teeming with salmon and meandering through wide marshes and tree-lined banks. Imagine the 1900s, with its engineered, channelized watercourse and its banks lined with polluting industries. This degradation of the valley was compounded by the addition of the Don Valley Parkway. Today, the Lower Don is the site of one of the largest urban environmental restoration projects in the world. Once an active industrial site in the 19th century, Milne Hollow demonstrates how a natural green space, two railways and an expressway can coexist in an urban environment, yet give the feeling of being in the wilderness. Experience a walk along routes of three buried waterways, all hidden from public view decades ago in the interest of progress. Enjoy the natural serenity of living ponds on the former site of Toronto’s largest brick works, right in the heart of the city. Taylor Massey Creek takes its name from the two families that owned the land the creek flows through. The Taylor family of paper mill fame owned the land west of Dawes Road to the Forks of the Don and the Massey Family’s Dentonia Farm occupied the land east of Dawes Road to Pharmacy Avenue. It was also known as Silver Creek in the past.